. . .night; with the shadows that gather tinder the narrow Gate of Humility; and beside it, blank as daybreak and abrupt as an abyss, the broad road that has led already to destruction. What can I say. Chesterton could write about making a peanut butter and jelly sandwich and could make it riveting. I did not finish it but loved his commentary on passing through Egypt. His reflections on the faiths of he region are as applicable today as they were then. The imagery is vivid. The setting is 100 years ago so much has changed but as history goes mans heart is strikingly similar. The "New Jerusalem" is the Jerusalem newly liberated from the Turks. This book is Chesterton's account of his journey there, very shortly after the end of the Great War. 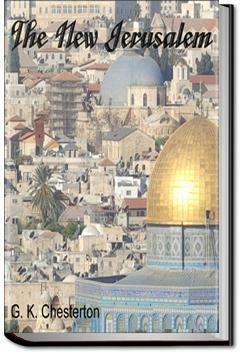 Chesterton takes a trip to Jerusalem, and talks about what he sees. More importantly, he speaks about what these things he sees make him think about. This book is a lengthy discourse about the Middle East, the relationships between East and West, and relationships between the various religions. It strikes us as odd that a nail should be so valuable or so vivid to the imagination. And yet, to men so close to Calvary, even nails are not entirely commonplace. Recommended to anyone who is extremely interested in Middle East politics or life. General Chesterton fans may or may not find this interesting.